Universally designed to fit over most Folk guitar cases. This cover has excellent insulation value from Colorado Case Company's unique Dacron Hollofil/metalized Mylar material, and it is weather tight. It has a large pocket, as well as a single strap that can be attached one way to carry the case horizontally at your side, or clipped another way to carry the case upright on your back. * All case covers come with a large pleated pocket on the front. 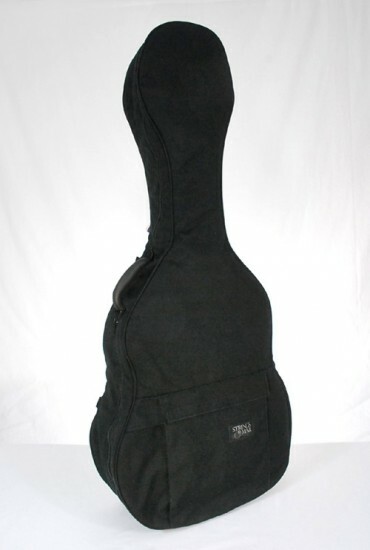 * All case covers have a sized handle flap to seal the case when using your hard case handles. * All case covers have one dual position strap which allows you to carry the case at your side or sling style across your back. * A pair of optional shoulder straps can be purchased separately. a 000 sized case, and the case cover was still too small for that. can offer some explanation. In previous transactions Strings By Mail have provided excellent customer service, and I especially like that with your shipment they provide you with the name and telephone extension of a person you will specifically get to deal with. A very nice touch.